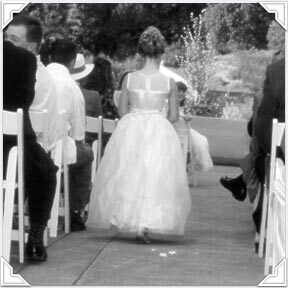 We create and host personalized websites for weddings. A wedding website allows you to share photos, stories and important information with your guests before and after your wedding. What are the benefits of working with MyWedSite? Unlike most other wedding website services, MyWedSite customizes each site to each couple; you do not have to choose from set designs. Graphic Designer, Lee Torbert has nine years of experience designing attractive websites. How long will my site remain on the web? Fifteen months, but if you would like it to remain for longer, there is $25 charge for each additional month. I am not sure about putting all of my personal information on the web? Your site CAN be password-protected so that only guests you've provided the password to will be able to see your site. Yes - UNLESS you choose to require a password. Once our site is created, how do our friends and family see it? They can view your site by using your personal URL (yourname.mywedsite.com). MyWedSite will create a site that will match your personal style. The site design will be based on your wedding theme, including colors and images. What if I need to change or update anything? The best and most accurate way to request a change is to email it. You may also call or FAX it in. Significant changes to the initial setup of the website are subject to a $50/hour charge. No - MyWedSite will take care of everything. How long does it take to set up the website? Once you have gathered all the information you would like to include in your website, it generally will not take more than a week before your site is viewable to your guests. When should I order my website? As soon as you have most of your logistics decided on; six to nine months before the wedding is recommended (but not necessary). My professional wedding photos have the photographer's copyright on them, can I use them on my site? You may only use them with your photographer's permission. Some photographers may not allow you to. If that's the case, you can always include photos taken by your guests.